He has hiked the Appalachian Trail, walking more than 2,100 miles from Georgia to Maine. His adventures have also taken him to Italy, Germany, Israel, and his favorite country that he has visited, Egypt. And he will soon travel to India to see two of his friends from that country be ordained priests—friends he met at Saint Meinrad School of Theology. Still, as Deacon Jeremy Gries prepares to be ordained a priest on June 6, he realizes that the greatest journey in his life has occurred within himself. Now 31, Deacon Gries worked for two and a half years as an engineer after spending seven years earning bachelor’s and master’s degrees in engineering—a scientific focus that matched his tendency to view the world and humanity in terms of black and white. But his time in the seminary and his ministry as a student chaplain at Methodist Hospital in Indianapolis have taught him to see the shades of gray in the human experience, especially when he talked to a woman who had been stabbed by her boyfriend and when he had to comfort someone who had just watched a friend die. That understanding particularly struck him as he tried to comfort a woman whose friend had died in an automobile accident. While those experiences have made him more sensitive to people, his love of the outdoors has always brought him closer to God. Ask his parents to share a defining moment from his life, and both Bob and Kathy Gries immediately mention 2001 when he spent six months hiking the Appalachian Trail that winds through 14 states. Eight years later, Deacon Gries is still drawn to the outdoors, listing hiking and canoeing as two of his favorite interests. He has also used his love for nature to help people. As a seminarian, he coordinated the efforts of 300 volunteers in a program that split firewood at St. Meinrad and then distributed it to needy families in southern Indiana. Starting on July 1, Deacon Gries will be the associate pastor of St. Monica Parish in Indianapolis. “Everything I’ve heard about St. Monica’s is great,” says Deacon Gries, a 1995 graduate of Roncalli High School in Indianapolis. “The diversity of the parish is great, and it has a huge number of ministries. I’ll have a lot of opportunity to work with people. He will be getting involved in a parish school just as his mother is ending her career as a teacher in a Catholic school. For the past 24 years, Kathy Gries has been either a kindergarten or first-grade teacher at Nativity School. She retires knowing that her son, Jeremy, has embraced the most important lesson she has tried to teach her children and her students. After his ordination at SS. 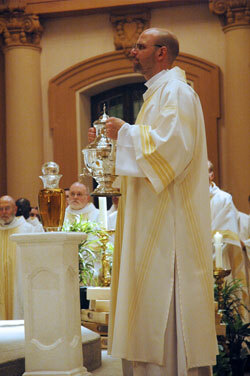 Peter and Paul Cathedral in Indianapolis, Deacon Gries will return to the place where his journey of faith began. 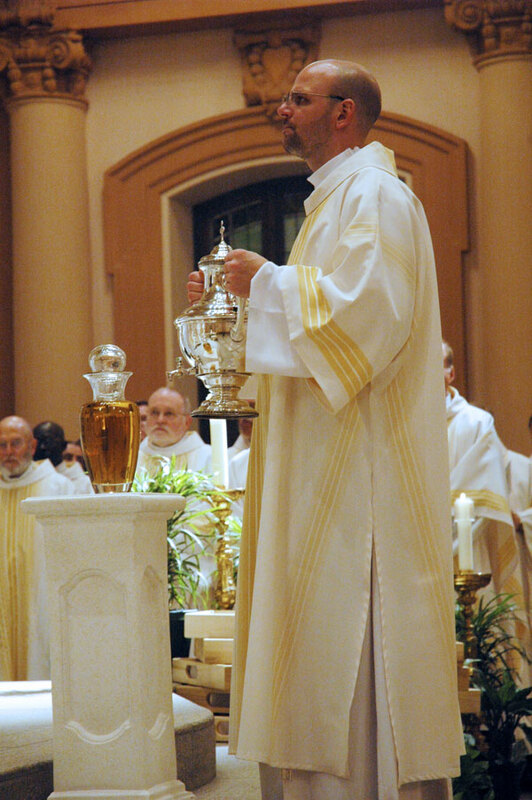 He will celebrate his Mass of Thanksgiving at Nativity Church at 11 a.m. on June 7. “I’m approaching ordination with a great sense of peace and accomplishment,” he says. “I’ve been preparing for it for five years. But I don’t see it as an end. I see it as a beginning. Favorite Bible verse: “I came so that they might have life and have it more abundantly” (Jn 10:10b).